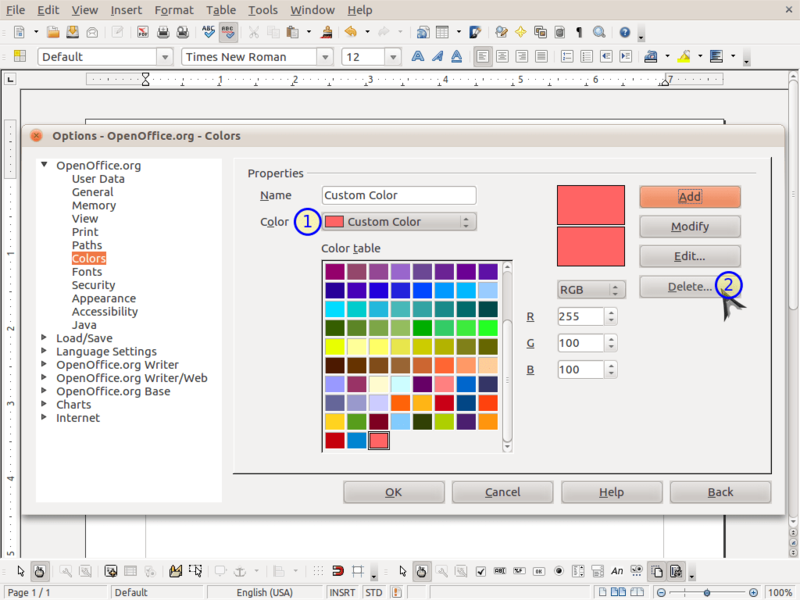 OpenOffice.org and the LibreOffice branch both suffer from an apparent restriction – the color palette appears to be severely limited. By default, you’re given a small palette of ~106 colors for everything from highlighting and borders to fill and font coloring. From within any program (Calc, Writer, etc.) in either office suite, go ahead and click Tools > Options in the top menu bar. Go ahead and open the top left navigation element (actually, it is usually already open for you) and then click the child element Colors. Enter in a name for your custom color where it says “Name” and then proceed to enter the RGB or CMYK values to the right. 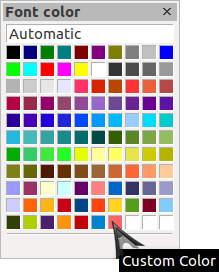 Once you see the color that you want in the lower color box, click the Add button. You can add whichever colors you’d like this way – just make sure they have unique names or you’ll get an error. Colors added here will be available throughout the entire office suite. is there a quicker way for that like those on microsoft office? 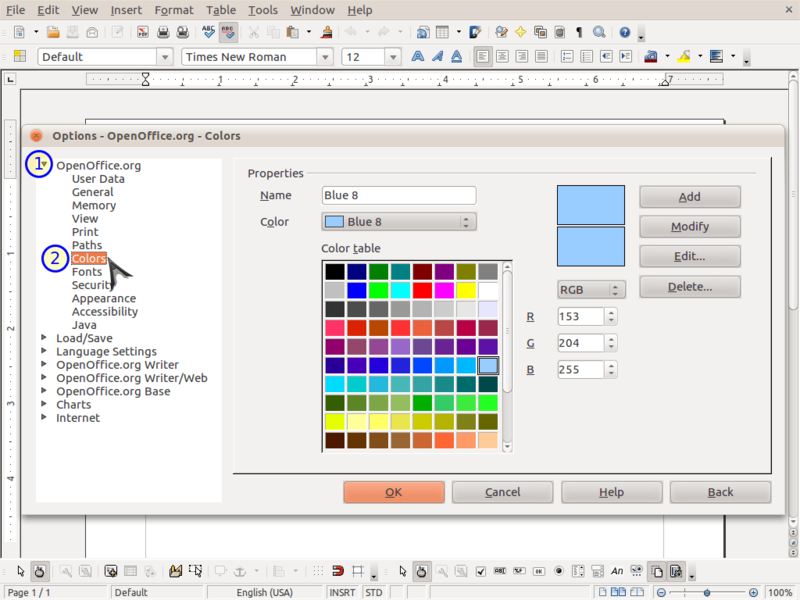 Some users will not have Options available under Tools, but will instead need to look under the OpenOffice.org menu to the left of the File menu. 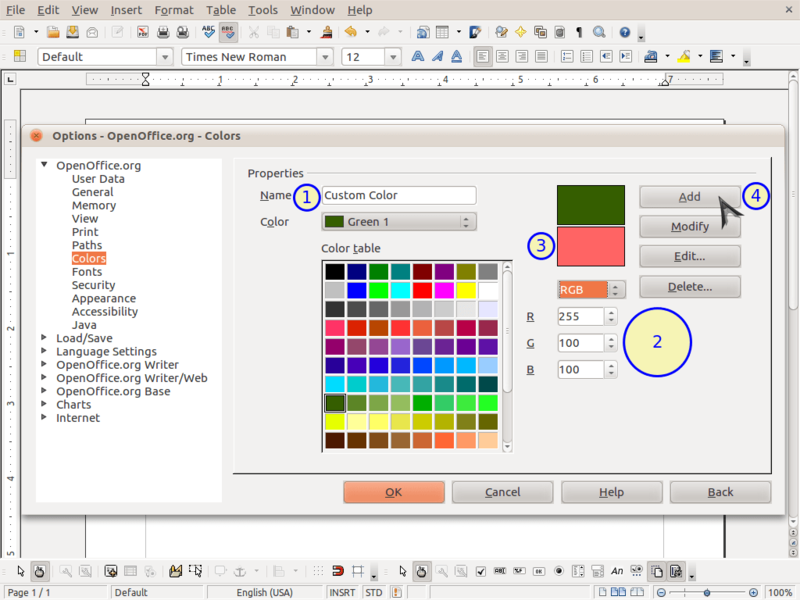 Go to Preferences > OpenOffice.org > Colors. Would be good to have an import/export function, so the list of colors can be edited within a text editor. Or the dialog would expose the name of the file where the colors are stored. Thank you very much! I was so limited by the colors that were available. This unlocks it for me. Thanks so much. 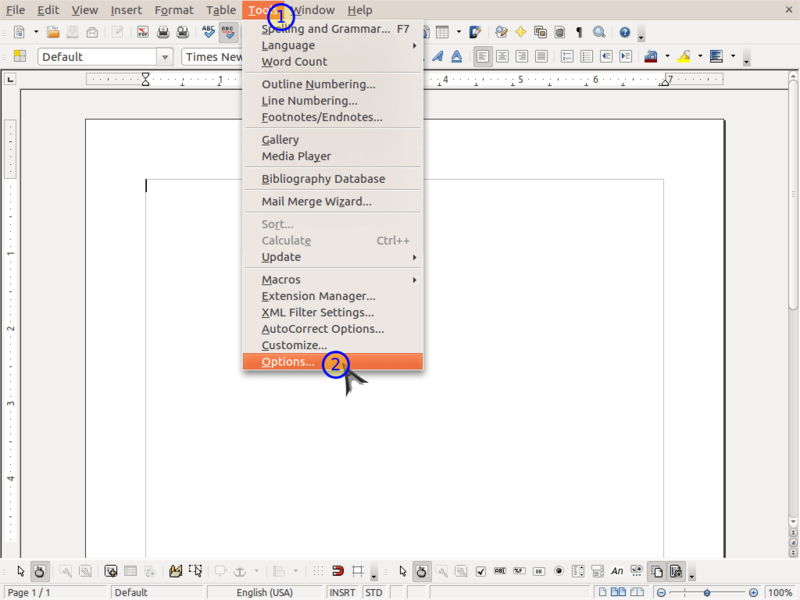 LibreOffice is still young, but I hope they make this feature more accessible and obvious. Could someone PLEASE rationalize these colour settings? I’d just like to have each colour and saturation once, and in a coherent format. I do not want to mess with the complicated settings myself, especially since I’d have to do it all over in each new version. It’s is not obvious… correction, “it is not microsoft’s way”. Most of the times, the learning curve is what makes people not to use libreoffice, most of the people don’t realize this is something different with diferent ways to do things, some times, it can do even more things. Thanks a lot! Very simply and very usefull for me. Arial Rounded MT Bold is the font I am using. At first it was filled black, I wanted to also have just the rounded outside black. I have it now but having trouble filling it back black. Highlighting and paint bucket says no fill. How do I get it back to fill? Computer Correct © 2018. All Rights Reserved.